All animals need a nice clean place to rest. They need a convenient place to relieve themselves. It’s, therefore, our duty to ensure this is provided for them. But where is the perfect place? Dogs might have it figured out. However, cats are a bit more particular about where they can all their own. A cat’s litter box is their little haven. It’s their personal space. We need to find one that’s just right for them. That’s why we set upon the search for the perfect cat litter box. And we found that there isn’t a shortage of good products. So, what features make the best litter box for multiple cats? The size, that’s the first thing to look at. If you want a litter box for multiple cats then finding one that’s big enough to fit all your cats is important. Next, the material used must be one that is not only free of harmful components but is also easy to clean. The perfect litter boxes have non-stick plastic used to ensure the cat waste doesn’t cling to the litter box. Finally, there has to be some odor absorbing capability. Some litter boxes come with pads that absorb liquid waste. Others have charcoal odor filters. Find the one that fits your requirements. Nature’s Miracle, the company that kicks off our reviews do so on such a high note. 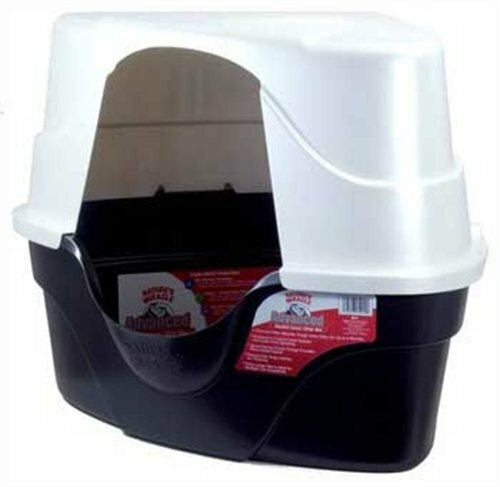 Their product, the Advanced Corner Hooded Litter Box is made with uniqueness and practicality in mind. It’s the realization that we hardly ever have a convenient place to put the litter box that inspired this creation. They decided that the best place a litter box can sit is at the corner. However, with the conventional designs, this was rendered impossible. This litter box solves that issue. It has a triangular design that allows it to slide onto any corner, tucking away from plain sight. Still, its size is perfect for multiple cats. Measuring in at 26 inches by 23 inches by a height of 11 inches, this litter box doesn’t take up much space. At the same time, it provides enough room for all your cats to use. The construction of the box is of a plastic type which guards against the growth of odor-causing bacteria. Furthermore, the surface is of a non-stick quality which is essential to prevent the cat’s litter from clinging onto the interior surface. This makes it easy to clean and maintain. Underneath the hood, there’s an odor control charcoal filter which further ensures that no odor builds up within Nature’s Miracle litter box. Next, we have the Purina Tidy Cats a litter box that offers convenience. It’s the convenience of having all you need in a litter box in one package. It’s the convenience of not having to endure long hours of cleaning. This product is an all in one. What this means is that on the purchase of the kit, you get a custom scoop, pellets and pads together with the box. The pellets, placed at the bottom of the litter box, absorb liquid from the cat’s solid waste. This filtration process eliminates chances of odor buildup and eases clearing of these wastes. The pellets last for a month so new ones are poured in each month. Using the attached scoop, you’ll be able to easily collect the solid waste in the litter box. The pad, on the other hand, is slid underneath the pellets. This component of the product absorbs urine and controls the odor. The pad works for up to one week after which a replacement is required. With such a combination, maintaining hygiene of the box is kept easy and painless for you. 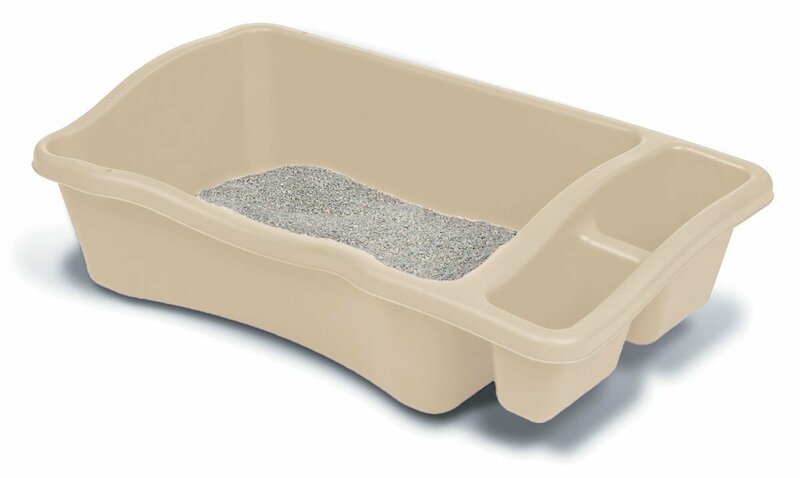 Simplicity is the mark of the Petmate litter pan. However, this simplicity shouldn’t be confused for ineffectiveness. This pan meets the high standards already set by the two other litter boxes reviewed above. Its design is basic but it sports an ample size to accommodate multiple cats’ needs. 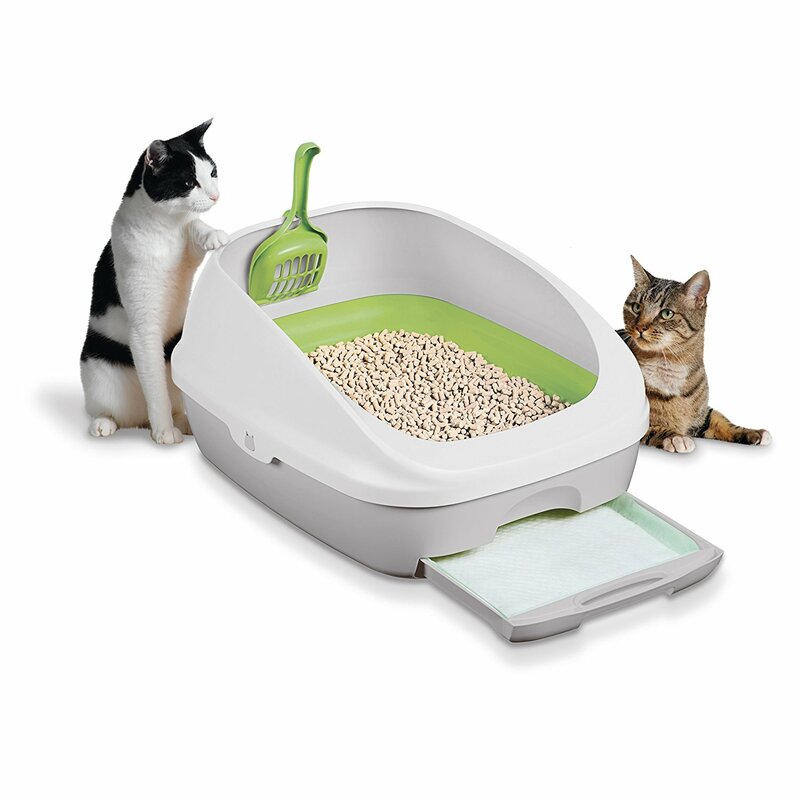 With dimensions of 34.7 inches by 19.8 inches by 10 inches, this pan is relatively larger than your average litter pan. And if you’re looking for one for multiple cats, this is a perfect choice. Indeed, this pan can hold more than 30 pounds of cat litter. To ensure your cats aren’t exposed to any harmful substances, the Petmate is made of a high quality material that ensures high standards of construction are maintained. This material has Microban, an antimicrobial protection which discourages the buildup of bacteria in the litter pan. With this, the odor is eliminated completely while the hygiene of your cats is maintained. Bringing to the table a bit more verve and personality is the Petphabet Jumbo Litter Box. It comes in a wide array of color options for one to choose from. 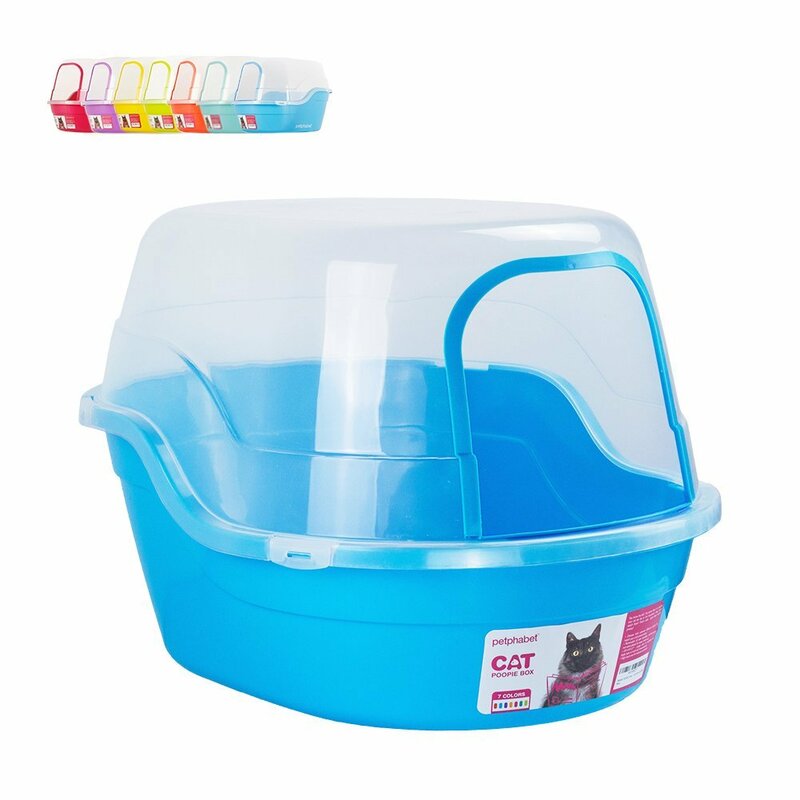 Each color is bright and vibrant, giving the litter box a playful personality just like your cats. You can choose from light blue, lime green, magenta, teal, purple, orange or yellow. Each option comes with the same level of functionality that you’re looking for in a cat litter box. The Petphabet box is large enough to accommodate two average-sized cats. With dimensions of 24.8 inches by 20 inches by a height of 16.5 inches, you won’t lack space to place it. And the rounded shape gives it a compact build. The top cover is removable and comes off without a strain. When off, you can easily scoop cat waste from the inside and properly maintain the box. The pan is deep enough to not just keep the waste inside but to also help control odor. Still, the Petphabet is made of advanced plastic technology which bears an antimicrobial ability. This provides a surface that’s non-stick, keeping the waste from clinging onto the inside walls of the pan. Cleaning it is, in effect, quite easy. Favorite close our reviews of the best cat litter boxes. And just like the others, this box is made with your cats in mind. It bears a resemblance to the others, sporting a familiar design and build. But this is a good thing. Covering the litter pan is a transparent cover while the pan itself bears a very ample size. Measuring in at 25 inches by 19 inches by 16.5 inches, this product is just the right size for your multiple cats. The front side of the lid is open to allow for easy entry and exit. The pan’s depth, on the other hand, is just the right size to keep the cat litter. It’s made of a premium thick plastic material which gives the Favorite Jumbo a lightweight quality. Despite this, the litter box is still quite durable, able to withstand the kind of battering that it’s bound to encounter from your cats. This material is also non-stick, discouraging cat waste from sticking to the bottom, allowing you to easily clear it when cleaning. Clearly, there isn’t a shortage of great litter boxes for your cats to spend their time in. The ones mentioned above have great qualities, from durability to functionality. As always, we must identify the one that edges past the rest. In this case, the competition was fierce. We’re therefore looking for the one that has the slightest advantage over the others. This is the one that is serious on odor prevention to the point of coming with odor control charcoal filters. It’s the litter box that’s designed to tuck away safely in any corner of the home. 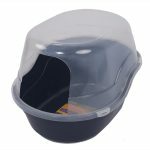 We’re talking about Nature’s Miracle Advanced Corner Hooded Cat Litter Box. It edges past the lot to claim the crown of the best cat litter box.